Cam Newton's season for the ages that culminated with a Heisman Trophy and BCS championship may have finally paid off. According to Darren Rovell of CNBC, Newton has landed the largest endorsement deal ever given to an NFL Rookie, which should finally make Cecil Newton a rich man, or at least the father of one. The quarterback with the insane skill set and Under Armour have come to an agreement on a multi-year shoe and apparel endorsement contract. The details and fine print of the contract have not yet been made public, but the deal will reportedly surpass Reggie Bush's 2006 deal with Adidas that paid the ex-Trojan guy who never played a down of college football $1 million per year. According to CNBC, Nike and Under Armour duked it out for the rights to have the projected top 10 pick wear their sneakers, shirts, jackets, hats, undershirts, sweat pants, sweat shirts, mittens, hoodies, sherzees and other miscellaneous sports wear. Which is interesting seeing as the University of Oregon, whom Auburn defeated in the BCS Championship game, wore 13 different Nike uniforms during the 2010 season thanks to the fact that Nike CEO Phil Knight is an Oregon alum. Meanwhile Auburn wore special Under Armour cleats for the big game. During Newton's 2010 rise to stardom, reports arose that the quarterback's father Cecil had attempted to sell his son's services to Mississippi State for around $180,000. Had Cecil succeeded, Cam might have never played another college game. 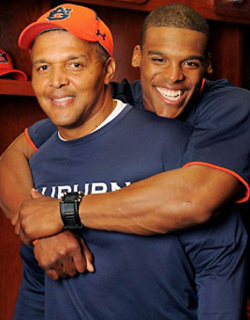 The NCAA eventually ruled Newton eligible due to the belief he was unaware of his father's attempt at cashing in on his skill set. Now, almost half a year removed from the controversy, Cam and Cecil will be livin' the high life and will have plenty of money to "protect this house" or any other house for that matter.